The name alone conjures up images of hidden pirate treasures and a tropical island paradise. If you like beaches, there are miles of white coral sands that dip invitingly into clear, warm turquoise waters. If you enjoy swimming, you’ll find the Indian Ocean was almost created with your pleasure in mind. Sun-worshippers will revel in year-round, balmy temperatures. For the more active and adventurous, there are more than enough sights to see from street markets and plantation houses, to medieval forests and the rare black parrot. Over 100 islands make up the Seychelles archipelago, with much to interest everyone. Much of the Seychelles’ beauty lies in its natural wildlife. Untouched for centuries, the islands are all sanctuaries for many rare and wonderful plants and birds. Whichever of the Seychelles islands you visit, you are assured a warm welcome and a fond farewell. Location: The Seychelles Islands are located in the Indian Ocean, northeast of Madagascar, and directly east from Kenya and Tanzania. Size: The Seychelles archipelago is made up of 115 islands covering 176 square miles, about the same size as Barbados or Andorra. Population: Around 91,500 people live in The Seychelles. Languages: There are three official languages in The Seychelles: Creole (based on a French patois); French and English. The Flag: The flag of the Seychelles was adopted in 1996, the third flag since independence from Britain in 1976. The colors are the official colors of two of the nation’s major political parties. The direction of the colored bands, represent a dynamic country forging into the future. Currency: The Seychelles Rupee (SCR) is the official currency, and is subdivided into 100 cents. The exchange rate is around US$1:14 Rupees. Many hotels and resorts will accept Euros and US Dollars. Getting to The Seychelles: There are no direct flights from the US to The Seychelles. Many visitors will fly into the international airport on Mahe (SEZ), via Dubai (Emirates), Abu Dhabi (Etihad), or Paris (Air France). There are also daily connections for onward travel between Mahe and Nairobi (Kenya Airways) as well as Johannesburg (Air Seychelles). Mahé is the largest and most important island of the Seychelles archipelago. This spectacular island is only 16 miles long but is dominated by a mountain range that forms the backbone of the island. The highest peak, Morne Seychellois, reaches a height of 2700 feet and provides a perfect backdrop to the capital city Victoria. Although Mahé is the economic and political center of the Seychelles it has still retained its natural charm and beauty. In many ways Mahé is the most spectacular of the islands, its huge mountains and lush tropical vegetation provide an inspiring sight. There are over 75 beaches scattered around the island and often you will find that you are the only people present. The beaches are idyllic, soft beautiful sand, fringed by swaying palm trees and a warm and inviting sea to help you cool off from the tropical sun. All overseas visitors arrive on Mahé, either by the port, which is next to Victoria or at the Seychelles International Airport. Victoria is small enough to walk around, as that is the best way to see the city and to get a feel of the place and the people. The market is a hive of activity daily except Sundays. Here it is easy to see why the Seychellois are often called the friendliest people in the world. The market sells locally made crafts, fish, fresh fruits and vegetables. The Botanical Gardens offer the opportunity to see some of Seychelles, unique and endemic plants in easy and comfortable surroundings. The gardens were established nearly 100 years ago and cover an area of 15 acres. The Clock Tower is the focal point of Victoria and was erected in 1903 to mark Seychelles’ “coming of age as a separate colony.” Although 90% of the total Seychelles population lives on Mahé (65,000) it still has a quiet and informal atmosphere. Parts of the island look as they did twenty years ago and parts are modern with high tech facilities. The nightlife is much livelier on Mahé than the neighboring islands. There are two casinos, one in Beau Vallon Bay and one at the Plantation Club in the south of the island. The restaurants offer fantastic cuisine with a variety of international and local delicacies, each with its own identity. Most of the hotels have entertainment in the evenings by local singers and bands and there are some nightclubs in and around Victoria for those who want to dance until the early hours. During the day Mahé has an unbelievable amount of activities to choose from with several well-run dive centers and water sport operators scattered around the island. Mahé has lots of nature walks and trails throughout the Morne Seychellois National Park, which covers an area of 11 square miles. If it is walking around an art gallery or an artist’s studio that takes your fancy then Mahé has this too. In fact Mahé can offer you almost anything you want. Praslin lies 22 miles north east of Mahé and is accessible by boat in two hours or by air in 15 minutes. When the Frenchman Lazare Picault first came upon Praslin on June 10th 1744, in the virtually uncharted waters of the Seychelles, he called it the Island of Palms, so impressed was he with its unbelievably lush vegetation. A century ago, General Gordon (of Khartoum) visited this island and became convinced that it was the location of the original earthly paradise, the Garden of Eden. He developed the idea when he saw the strange shape of the “coco-de-mer”, the enormous coconut shaped like a female pelvis. He then identified this with Eve. Once the haunt of Arab traders, a sometime treasure house for pirates, Praslin is the blueprint for everyone’s idea of the perfect tropical island. Praslin measures only 6 miles by roughly 2 miles. Yet, as visitors discover, in that limited space it has richness and variety. All around Praslin are huge, fantasically shaped rocks, which look like vast Henry Moore sculptures. In comparison, the coral reefs are mere striplings, perhaps six to eight thousand years old and teeming with life; a landscape painted in the myriad colors of living coral, jewel-like shells and an amazing nine hundred species of fish. Much of the interior is virtually virgin forest, and the exquisitely beautiful Vallée de Mai, declared a World Heritage Site by UNESCO in 1984, is the home of the unique coco de mer, vanilla orchids, many species of lizards and some of the earth’s rarest birds. The coco de mer is a fruit from an extraordinary palm tree, which is found in only one place in the world, the Vallée de Mai on Praslin Island. This strange object was much prized over past centuries; philosophers believed it was the fruit of the tree of knowledge, and that it grew under the sea, on account of the fact that it floated as far as the Maldive islands. It gained a reputation as an aphrodisiac, perhaps because of the singular shapes of the male stalk and the female fruit. The Emperor Rudolph II of Hapsburg, towards the end of his life, offered two gold florins for one of those fabulous nuts. Praslin, though small, is the second largest island in the Seychelles and more than warrants exploration. It is also the ideal place from which to visit many of the islands. It is also home to three of the world’s rarest birds: the Seychelles bulbul, fruit pigeon and the black parrot. An aura of charm and tranquility surrounds La Digue. This island is accessible by boat and helicopter; about two and a half hours from Mahé and thirty minutes from Praslin. For years the way of life on La Digue has remained unchanged, transport is mainly by ox-cart or bicycle. On La Digue, time seems to stand still.Although La Digue can be visited on a day excursion, the island’s rare calm and friendliness of its people are too precious to be passed by in haste. The ox-cart excursions include some of the more picturesque parts of the island where some fine traditional houses are situated. Wide deserted beaches are perfect for long walks, safe swimming, snorkeling and fishing. In the woods of La Digue can be found the rare black paradise flycatcher. Although this bird was once thought to be extinct, recent estimates suggest that there may be as many as one hundred on the island. Cycads, one of the oldest and most primitive of plants, are to be seen growing above the quiet roads of the island. La Digue is the fourth largest island in the Seychelles, measuring three by one miles, and is part of the granitic group. It lies 25 miles from Mahé and just over a mile from Praslin. The island has no natural harbor and is protected by the coral reefs, which circle it, together with masses of pink granite rocks, which seem to have exploded around the coastline. Bird is a coral island some 58.5 miles from Mahé. It is 1500 meters long and 650 meters wide. Bird Island can be reached in six to eight hours by sea or thirty minutes by air. The French named it Ile aux Vaches, referring to the presence of dugong sea cows, which became extinct many years ago. The island is best known for the one and a half million sooty terns which nest, breed and hatch their eggs from May to November. Apart from this spectacular colony of migrants, Iles aux Vaches has also a population of fairy and nody terns, cardinals, ground doves, mynahs, crested terns and plovers. The giant tortoise Esmeralda is also a resident of this island and is said to be about 150 years old. The island happens to be on the edge of the Seychelles Bank where the sea drops suddenly to over 1000 fathoms. It is therefore an ideal spot for those in search of big game fish. Bird Island is not only a paradise for the ornithologists, but is also a unique private island, completely surrounded by a sparkling white beach. The tranquility of a spacious chalet with a terrace facing the sea and a delicious Creole cuisine served in a friendly atmosphere is the welcome extended to everybody on Bird Island. The atoll Aldabra is a World Heritage Site with five times as many giant land tortoises than can be found on Galapagos. Aldabra has by far the world’s largest population of those reptiles once common throughout the region. The last remaining flightless bird of the Indian Ocean, the white-throated rail, is found only on Aldabra, together with the Aldabra drongo and unique varieties of sunbird, foddy, white-eyed bulbul, nightjar, coucal, pigeon and turtle dove. Huge colonies of spectacular lesser and great frigate-birds breed alongside red-footed boobies in the mangroves which border the northern rim of a huge lagoon. The shallow waters are patrolled by dimorphic egrets, found only on Madagascar and the Aldabra group of islands. Along the shoreline, the Aldabra sacred Ibis together with a whole host of black-napped and crested terns including caspians may be seen. Other birds include the greater flamingo and the malagasy kestrel, which are probably recent colonists. The steep walls around the raised limestone islands of Aldabra atoll have rarely been dived. Fish life is prolific while over 2000 green turtles breed on the beaches each year. Dolphins and occasionally whales can be seen offshore. 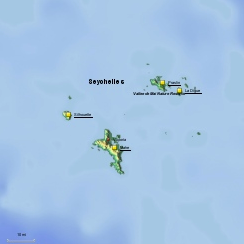 The atoll consists of thirteen islands which make up about one third of Seychelles’ land mass. It is a raised atoll, with two distinct terraces at four meters and eight meters above the sea level, and probably dates from about 125,000 years ago. The mushroom-shaped islands of honeycombed pinnacles of limestone are known locally as “champignons”. Until recently, it has only been possible to visit Aldabra by cruise ship or chartered yacht from Mahé. However, an airstrip has been constructed on Assumption Island, which lies to the south of Aldabra. Accommodation will soon be available for limited numbers on both Assumption and Aldabra. Guides, trained by the Seychelles Islands Foundation, which administers the atoll, will soon be able to reveal the treasures of this unique world to those who seek one of the last unexplored corners of the world. A few miles from Praslin is the islet of Cousin. Cousin, a bird sanctuary, can be visited by prior arrangement only. It is about one and a half hours from Praslin by boat. The island is owned by the Royal Society for Nature Conservation (RSNC), administered by the International Council for Bird Preservation (ICBP). Cousin extends over 55 acres and is entirely dedicated to nature. In fact, the island was made a nature reserve in 1968, when it was bought by the RSNC as a haven for endangered species of land and sea birds. Furthermore, the Seychelles Government declared it a Special Reserve in 1975, thus offering all the wildlife on the island legal protection. Among the species to see are the Seychelles fody, the Seychelles turtle dove, the white-faced tropic bird, the wedge-tailed shearwater, the fairy tern, noddies and bridled terns. The Seychelles brush warbler can be found only on Cousin, Cousine and Aride. The most accessible and economically significant island of the Amirantes, Desroches is a 3 mile long island that is part of huge lagoon. Most of the rim of the lagoon is fully submerged which provides excellent diving conditions. The island is named after an eighteenth century administrator of Mauritius who was governor from 1767 to 1772. Desroches is the only outer island with a regular air link to Mahe; the route is serviced five times a week by Air Seychelles and the flight duration is about fifty minutes. The island has been well developed with timber and coconut plantations and it is said that Desroches provides the best copra in the Seychelles archipelago. Desroches is one of the most densely populated of the outer islands with approximately fifty inhabitants who supply copra, timber and charcoal to Mahé. Desroches is an excellent base for exploring the Amirantes and its twenty-eight islands and provides excellent bird watching, diving and fishing.